The event will be held in Bad Hersfeld (Frankfurt, Germany) from September 21st to 23rd, 2016 and is sponsored through funds of the Austrian Development Cooperation and with the support of GIZ (2). To consolidate the knowledge around solutions that have proven to work and their enabling factors. To present different models of financing, business models and technologies that enable the fast uptake of such solutions. To provide new roads for research and innovation. The US based company UGE (http://www.ugei.com/) has developed UGE SET, a proprietary system design software, built to optimize microgrid energy systems to provide you the lowest cost of energy. UGE SET (the Site Evaluation Tool) uses time-step analysis to simulate the electrical load, weather resources, energy generation and ssociated costs in one-hour increments for the entirety of the project lifetime, allowing the user to confidently design microgrid systems. As stated in the white paper recently launched by the company (1), "UGE SET allows for much more detailed modeling of the performance of the system, leading to much greater confidence in the ability of the system to meet the project’s requirements and predict the ongoing costs". The software returns a series of graphs and metrics that describe the configuration and performance of the optimal system (or alternatively any of the modeled systems) for technical review and saves all of the information to a PDF file. Much more detailed breakdown of CAPEX and operating, expenses, making it much easier to accurately calculate system cost. Use of cost escalators in order to account for the rising costs of fuel, electricity and the value of currency. Ability to specify the resource dispatch order accurately simulating the system performance and associated expenses. The Alliance for Rural Electrification (*) kindly invites all members and friends to a two information packed days on Off-Grid power with solar, wind and hydropower. The workshop will be held in Memmingen (Germany) on September 25 and 26 this year. Special Guest-Speaker Christian Felber: "Economy for the Common Good"
This workshop, to be held on September 21st in Milano (Italy), has the aim of sharing the progress made, and identifying future solutions in financing investments for access to modern energy via off-grid solutions and access to clean cooking facilities. The World Access to Modern Energy initiative (1) (WAME) and the Africa-EU Energy Partnership (2) (AEEP) have joined forces to set up this forum. As previously informed on this site, the International Energy Agency has estimated that, in order to provide universal access to modern energy, US$750 billion of cumulative investment is necessary in the period from 2010 to 2030. This is additionally with respect to the amount already foreseen by the most optimistic policy scenario. While the majority of investments in energy access are geared toward extension of national electricity grids, the majority of those who currently do not have access to energy will more feasibly be reached through off-grid solutions and access to clean cooking facilities. As such, the workshop will focus on leveraging investment opportunities to access to electricity through off grid energy access technologies. Off-grid solutions, which provide electricity to rural areas that are not (or expected to be in the foreseeable future) serviced by the national electrical grid require numerous investments and financing mechanisms of a small-to-medium size. The same applies to clean cooking solutions. As such, this off-grid population presents a significant opportunity for business for local administrations or nonprofit organizations to engage with these communities, as well as a significant market opportunity for for-profit companies. But specific financial resources are needed. (1) WAME&EXPO2015 is a non-profit association which has been founded by eight of the main European energy companies and EXPO2015, whose theme is Feed the Planet, Energy for Life, to bring to the attention of the public the important social issue of Access to Energy. Its mission is to raise awareness of the problem through information collected on its web site, www.wame2015.org, as well as through workshops and events during the EXPO semester. (2) The Africa-EU Energy Partnership (AEEP) is the main long-term framework for structured dialogue and co-operation between Africa and the EU on energy issues of mutual strategic importance, and with a focus on rural energy access and poverty alleviation. The AEEP engages the private sector, civil society and academia to push on-the-ground action towards sustainable and efficient energy access in Africa, with particular focus on rural access. The AEEP has also initiated the Africa-EU Renewable Energy Cooperation Programme (RECP) which supports market development for meso-scale energy projects in Africa. The ECOWAS Centre for Renewable Energy and Energy Efficiency (ECREEE), the African Development Bank (AfDB), the CTI Private Financing Advisory Network (CTI-PFAN), the United Nations Industrial Development Organization (UNIDO), and the German Technical Cooperation (GIZ) are jointly organizing the ECOWAS Sustainable Energy Policy and Investment High Level Forum from 14th to 18th September 2015 in Abidjan, Côte d'Ivoire. The event is supported by the Spanish Agency for international Development Cooperation (AECID), the Austrian Development Cooperation (ADC), the European Union (EU), the United States Agency for International Development (USAID) and the Global Environmental Facility (GEF), and the International Renewable Energy Agency (IRENA). The Forum will bring together top-level policy and decision makers, project promoters, investors and international partners to meet, discuss and explore relevant inter-linkages between enabling environment and project development and identify concrete investment opportunities. It will facilitate match-making for investment ready projects as well as feature the state-of-the-art in the Sustainable Energy Country Action Plans development process in the West African region. Furthermore, the Forum will provide a veritable platform for stakeholder dialogues on the required next steps to mitigate existing barriers to sustainable energy investments in the ECOWAS region. 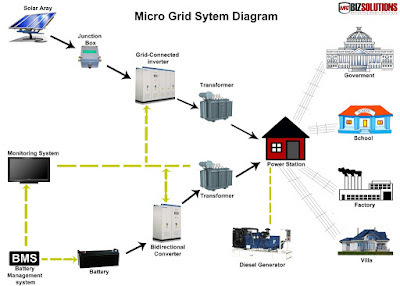 Total identified microgrid capacity has grown from 4,393 megawatts (MW) in the second quarter of 2014 to more than 12,000 MW today, according to Navigant Research (1) The drivers behind this growth range from the need for greater grid reliability and resiliency, to the need for integrating more renewable energy into the grid, including: distributed solar, wind, biogas, etc. 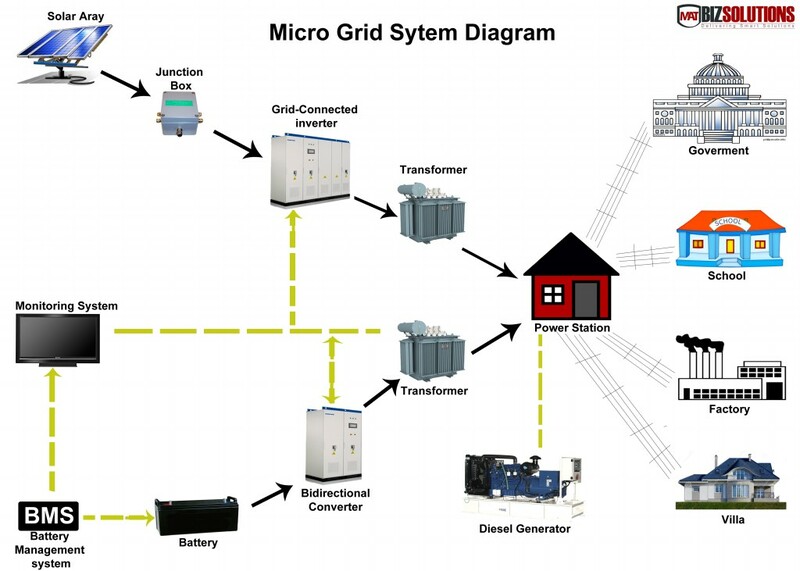 These trends, as well as the need to reduce reliance on fossil fuels and improve the economics of off-grid energy systems, are are compelling utilities, municipal governments, rural and island communities, and other stakeholders to look at microgrids and virtual power plants (VPPs) as key strategies for meeting the world's future energy needs. The Microgrid Global Innovation Forum 2015, September 16-17, in Barcelona (Spain) will bring together thought leaders, energy executives, and project managers from around the world for focused networking and information sharing concerning the design, implementation and operation of hybrid energy, renewables-centric microgrid systems. The emphasis is on maximizing the effective use of sustainable and distributed energy resources, refining the positive business model for a range of microgrid deployments, and sharing real-world system case studies in both grid-tied and off-grid/remote/island environments. This industry-open, technology-neutral event is a unique opportunity to interact closely with fellow practitioners and researchers who are pushing the envelope of sustainable energy microgrids for the future network. 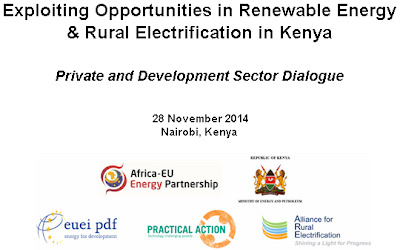 As part of the programme for political dialogue created by The Africa-EU Energy Partnership (AEEP) and EU Energy Initiative -Partnership Dialogue Facility (EUEI-PDF), a structured dialogue will take place next November 28th in Nairobi (Kenya) to discuss priority areas of Kenya's energy strategy in the Sustainable Energy for All (SE4ALL) context. 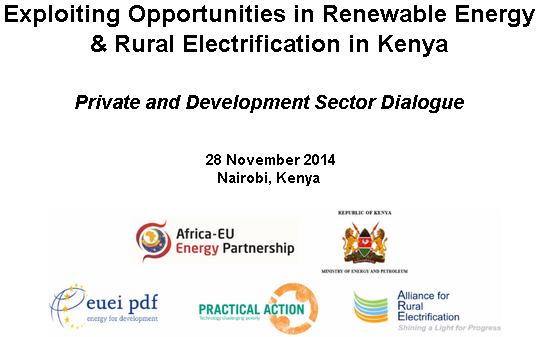 Apart from the AEEP and the EUEI-PDF, the event will be held in conjunction with the Ministry of Energy and Petroleum of Kenya, and with Practical Action and Alliance for Rural Electrification as representatives of the civil society and the private sector respectively. Strengthening mutual understanding, as well as partnerships between civil society, private sector and the government.